For those unfamiliar with the Canary Island, Lanzarote is the fourth largest of the coastal paradises, measuring in at 846 km² of exotic joy. It’s a landscape sprinkled with palm leaves and white sand, doused in the heat of the hot sun and painted with the warm glow exuding from the azure waters that glide across the coast. If you’re lucky enough to visit, it’s worth equipping yourself with some knowledge of where to go, what to do, and, ultimately, how to live it up in style. Before you hit the beaches, you’ll need to find a place to rest your head. There is a range of gorgeous Villas in Costa Teguise to choose from, an especially good options for parties of four or more. Of course, if money is no object, why not enjoy the royal treatment at Lanzarote’s five-star resort, located on the Southeast shoreline. It’s a subtropical realm of euphoria, with swimming pools and restaurants galore, not to mention its own shopping district. What Lanzarote is best for. The ‘Playas’ are scattered over every edge of the island, so it can be hard to choose the best one if you don’t know what to look for. The biggest, most ‘touristy’ beach on the island is the Playa de lasCucharas, running alongside Costa Teguise, fully equipped with cafes, parasols and surf schools. 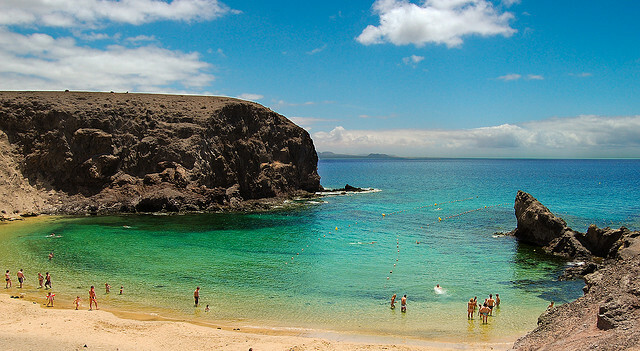 For a more secluded fantasia, why not try the likes of Playas de Papagayo? It’s located Southeast, and it is downright beautiful, boasting some jaw-droppingly clear turquoise waters and secluded caves. It has an admission fee, but its worth it for fine sands and – if you’re after that kind of thing – a hidden nudist beach. You’ll be glad to know that Lanzarote is jam-packed with things to see and do. Kick things off with the Timanfaya National Park in the Southwest, a volcanic formation where 600⁰C geysers roar and quality food is cooked with geothermal heat, served at the residential El Diablo Restaurant. If you’re a fan of the artist César Manrique, then you need to check out both the Cactus Gardens and the beautiful Jameosdel Agua. Also worth noting is the natural though unorthodox beauty of El Golfo, a lagoon coloured emerald green by the organic algae that inhabits it. Though there is an abundance of buses and taxis, it is actually a lot cheaper – not to mention far more convenient – to rent a car, from as little as €15 a day. Low fuel costs mean that, if you’re planning on really exploring the island, a car rental is the most economic way of doing so. This entry was posted in Places to visit, Tourists destination, Vacation spots and tagged attractions in lanzarote on August 24, 2013 by Yami.